Around 1978 rope-wick applicators first began to be used, and soon became a widely adopted method for selectively applying glyphosate, especially in row crops. Many variations of the basic rope-wick concept were later introduced, such as the roller applicators, also called weed-wipers. Both types obtain selectivity when using glyphosate by mechanically placing the herbicide solution, so that it does not come in contact with the crop. In these techniques the rope or roller is saturated with herbicide. The applicator is then dragged over the area, wiping the herbicide solution onto the leaf surfaces of the target plants. Plants contacted by the herbicide solution are destroyed; therefore, the weeds have to be taller than the desirable crop or forage. Among the many pasture weeds in Florida, perennial grass weeds tend to be the most difficult to manage. Vaseygrass (Paspalum urvillei) and broomsedge species (Andropogon spp.) are two examples of problematic, tough to control perennial grass weeds. While smutgrass is often considered to be the most problematic grass weed in perennial grass pasture systems, broomsedge species are a very close second. Vaseygrass tends to invade wetter areas of pastures, and has become problematic in these areas throughout the state. UF/IFAS researchers believe that the proper use of rope-wick or weed-wiper applicators might be an effective way to apply broad-spectrum non-selective herbicides, especially glyphosate, on these tough perennial grass weeds. Controlling these weedy grasses should increase forage production, and potentially increase profitability, with higher stocking rates. Therefore, preliminary trials and experiments have been conducted in south-central Florida over the past few years with the overall goal to test the efficacy of this method in controlling perennial grass weeds. Broomsedge species are native, warm-season, short-lived perennial bunchgrasses with an average life span of 3 to 5 years. While some species are desirable in natural areas and native rangeland, they are becoming problematic in improved bahiagrass pastures. Since no herbicides can selectively remove these species, the use of the weed-wiper for selective control was investigated. In August, 2014 glyphosate (10% v/v) was wiped onto broomsedge in two directions. Within a 2-week period, broomsedge plants began to show signs of glyphosate activity. Unfortunately, the treated pastures were mowed at this time for a grazing trial. However, one year after treatment, the broomsedge population had declined by approximately 70%. This pasture was wiped a second time in the fall of 2015 in two directions using the same concentration of glyphosate to control escapes from the first application. After investigating the pastures again in June, 2016, nearly 95% of the original population appeared to have been controlled . 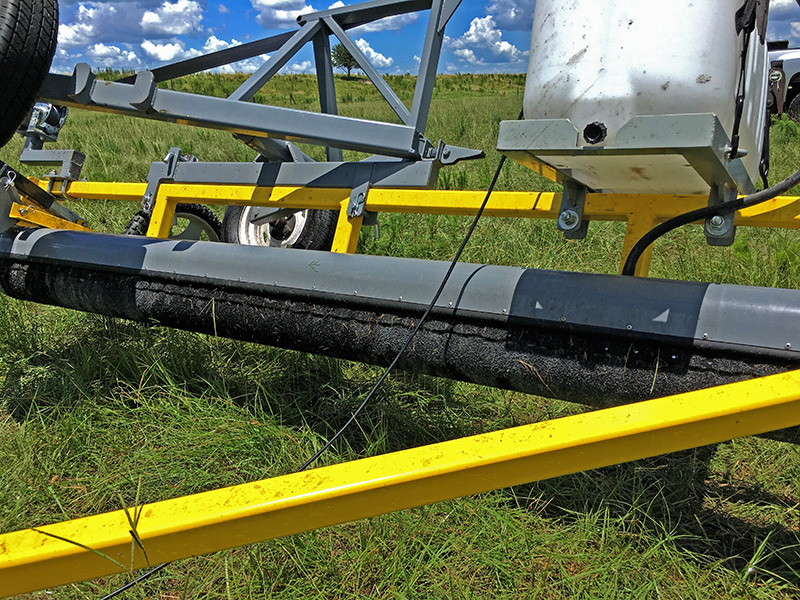 The first experiment with broomsedge prompted researchers to investigate the use of the weed-wiper on vaseygrass, at the Range Cattle Research and Education Center in the early summer of 2015. A bahiagrass pasture with vaseygrass was mowed and then wiped with a 10% v/v glyphosate solution approximately 30 days later. The pasture was split in half, with one-half receiving glyphosate in only one direction, and the other two directions. Control was evaluated at 30 and 60 days after treatment. The results from this trial indicated that wiping vaseygrass in a single direction resulted in kill of the very top portions of the plant, but the base of the plants remained viable. Conversely, the entire vaseygrass plant, including the roots, was killed when plants were wiped in opposite directions (2 passes). Overall, the use of a weed-wiper appears to be fairly easy. However, there are definitely challenges when using this technology. I often refer to this method of weed management as an “art” rather than a science. I have found that it takes significant practice and patience when using the weed wiper. This ensures that you have sufficient herbicide solution on the wiper as well as enough growth of the target weed to ensure proper herbicide interception, while limiting the interception of non-target, desirable plants. Furthermore, some plants grow faster than others, and not all plants will be controlled within the same year. Therefore, it will likely take multiple years of wiper applications for satisfactory control. In closing, be sure to follow the herbicide labels as there are restrictions when using glyphosate with the weed-wiper. For example, the Roundup PowerMax II™ label indicates that livestock should be removed prior to application, with a 3-day grazing restriction, and that it should not be applied to more than 10% of the total field area at any one time.